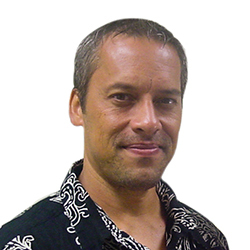 PETER BRITOS teaches at Hawai`i Pacific University (HPU) in downtown Honolulu where he is Program Chair of Multimedia Cinematic Production in the College of Liberal Arts. At HPU he mentors writers, designers and media artists, and helps produce and curate the annual HPU First Look Mixed-Media Festival and M.A.P. (Maoli Art Pedagogy) Exhibitions. Dr. Britos has had an eclectic career as an athlete, writer, producer, professor and mixed-media artist. Previously, he was Gallery Director for the Hawai`i State Art Museum (HiSAM), a division of the Hawai`i State Foundation on Culture and the Arts. Dr. Britos managed the museum, curated exhibitions and produced museum and media events. From 2003 through 2006 Pete taught screenwriting, media studies and cinematic and digital narrative production at the University of Hawai`i (UH), where in 2003 he returned to help in the creation of the UH Academy for Creative Media (ACM). As Director and Chief Academic Officer of the Academy, he wrote the ACM’s establishing documents and taught its inaugural courses. During his tenure as Director and Chief Academic Officer, the ACM was approved as an official entity, funded by the state legislature, and launched with award-winning student work. From 1991 to 2003 Britos was affiliated with the University of Southern California's School of Cinematic Arts (USC-CA). He worked at USC in the Graudate Screenwriting Program, as a Predoctoral and Postdoctoral Fellow, Graduate Instructor, Research Associate and Faculty Member. At USC-CA he taught Global Media, U.S. TV and Video History, Paramilitary TV, and Oceanic Film, TV and Multimedia Culture amongst other courses. He is the recipient of various academic and industry awards including the FINE Fellowship at Carnegie Mellon for gigapixel photography, the Walt Disney-Hollywood Pictures Fellowship Writers Award, the USC Associates Scholarship for Academic Excellence, the Bernard R. Kantor Memorial Scholarship for Academic Excellence, the inaugural USC Postdoctoral Fellowship in Critical Studies, the CNTV Advanced Screenwriting Analysis Scholarship, the USC All-University Predoctoral Merit Fellowship, and the UH Myrtle Clarke Creative Writing Award. Britos has served as faculty at USC-School of Cinematic Arts, University of California Santa Barbara Film Studies Department, the UH Department of Information & Computer Sciences, the UH Academy for Creative Media, UH School of Communications and the UH Department of English. He has as well served as a Writer-Consultant at USC's Institute for Creative Technologies (ICT) in Marina del Rey. In Burbank he was Executive Vice President of Production and Development at the Clear Channel Communications hub for Rick Dees, Dees Entertainment and Netstar Communications. At the Hawai`i KHNL-KFVE station he was the broadcast industry's first Media Manager at the first all-digital newsroom in the world. At CBS Television City he produced music artists and other celebrities on late-night television for Quincy Jones and David Salzman. Segments he wrote and produced include Ice Cube, Master P., Snoop Dogg, Jon Voight, Robert Duvall, Enrique Iglesias, Pamela Lee Anderson, Samuel L. Jackson, Laurence Fishburne, Carmen Electra, Yo Yo Ma, Kevin Bacon, Chow Yun Fat, Hilary Swank, Jon Stewart, Michael Moore, the Harlem Globetrotters and many more. Britos earned his M.F.A. from the USC-CA Graduate Screenwriting Program and Ph.D. in Critical Studies from USC-CA. He earned a B.A. in English at UH-Mānoa, an AA from Leeward Community College and a Diploma from Castle High School. He also attended the University of Neuchâtel, Izmir High School, and Heidelberg High School. Britos enjoys bodysurfing, free-diving, painting, filmmaking, photography, and hanging with his family. He is a coach for elite and junior athletes, and is a former multiple Hawaii State Racquetball Champion, Swiss Champion, Southern California Champion and a World Outdoor Racquetball Champion.